I hope you get better and surgery is not very painful. Ms. Bledsoe our substitute is doing well and I hope you are doing well too. Last night was awesome because Obama won last night. I was so happy. I wanted him to win. My grandfather voted for Obama. When it's a sunny day I l like to play baseball. I also like to fly a kite. I wonder if a lot of people like to fly kites too? When it is sunny out side I like to play soccer, do you like to play soccer? I like the short school days but I feel weird because I don’t have a thing to do. The thing I do like about the short school days is I have a lot of time to play with my friends at home. Tomorrow I’m going to a conference. I’m so nervous. I hope I get a good report card. I want it to be good. I hope every body gets to get a good report card. It is good to have a good report card so you can show your mom or dad. Report cards are scary because you could get a bad grade. I hope my brother gets a good report card and I wonder if he will get a good report card. You might be bad at math or be bad at spelling or you just will be bad at reading. I wonder if I will get a good report card. There was a turkey. It was a very fat turkey. A hunter came and the turkey was scared. He ran and ran till he could not run anymore. The Turkey said to himself I’m too old to get shot. I have to take care of my family. The turkey didn’t see the hunter anymore. I’m glad that I’m not a turkey dinner anymore. I better get home. It’s getting late. I’m home said the turkey. I’m going to sleep now. Good night. Dear Mr. President. Can you help us? Arbor Heights is in closure. Can you tell the people who own our school to not close our school? But I’m glad that you won. I was so happy that you won. I hope that you can save Arbor Heights. And I like all the teachers here and I’ll miss all the teachers and my friends. This year I’m going to recycle. Also I’m going to work out more because it is good for your body. I’m going to do my home work right when I get home. So I could play with my friends. And also I’m going to help my mom around the house. My winter break was great. I played in the snow all day, it was very fun. I also went skating. It was very fun. At the Inauguration Obama did a very good speech that meant a lot to a lot of people. I’m glad that Obama won. Obama has very cute girls. I bet that they're very happy that their dad is the president. If my dad was the president I would be happy. And I hope that the presidents daughters are happy too. I’m thinking about my little brother. I hope that he is being good in class he is I think that he is on the rug doing calendar. Miss Bailey has been sick for a while. I feel bad that she is sick. I hope that she is okay. I wonder if she has someone to take care of her? The best place to sit in the classroom is in the front of group one because you can see the stuff on the board perfectly. And it is just cool to sit in. And also you might sit by your best friend. I’m thinking about the party, it is going to be awesome. We might get cup cakes, maybe he will bring pop. That would be awesome. I can’t believe that he is going to be nine. I wonder what kind of cupcakes he will have for us. Maybe he won’t even bring any cupcakes for us. That would be bad because I love cupcakes. My favorite game to play outside is big 4 square. The reason that I play big 4 square is that the ball is so big. I play this game at school. I like to play it in the afternoon because I get a longer time to play. And some times I lose and I don’t like that because some times people cheat and I don’t like that. L.V. I took five planes in all. It was so fun, we stayed there for three days. When I was there I went on a lot of rides, it was awesome. Also the hotel that I stayed at was awesome. And the beds were so big. I had the best time of my life. Also when I was there I saw a lot of magic tricks. They were so awesome. Like how do they do that. I wanted to get something from the magic store but my mom did not let me. And I repeat it was the best time of my life. My spring break was awesome. On my spring break I went to LAS VEGAS. I took five planes in all. The hotel that we stayed at was the CIRCUS, CIRCUS it was awesome and they had a heart shaped pool. And when we were there we went to a amusement park. It was awesome. I’m thinking about Ray and what he is doing in his new school in California. I hope that he is having a great time. I’m also thinking about what we are going to have for lunch. I’m also thinking about my little brother. I hope that he is being good in class. I’m feeling a bit scared because I was not here yesterday. But the good part is that I’m gong to room 18 and that was one of my favorite teachers. It is going to be awesome. But I don’t know what I’m going to say. So I’m extra nervous. And the people that I’m with are doing great. I hope that I’m good too. My plans for the weekend are that I’m going to get my Easter basket today it’s going to be awesome. I wonder what it is going to be. And I have nothing to do the rest of my weekend. Yes I was thinking about the wasl. I thought it was going to be hard but it was is so easy. I couldn’t believe it. I was so glad that it was easy. I hope that I will pass. I think that I will. And I also hope that all the people in the class pass. It is probably easy for them too. The first thing that we did was the reading part of the wasl and that was very easy. And then of course we did the second part of the wasl. And then we did the math part of the wasl and that was easy too. We were on the first part of the wasl for the math part. And I love the snacks in the middle of the wasl. Today we had cheese and carrots. They were very good. I hope that global warming stops because the animals in cold places, their homes are melting because of global warming. And that is the reason I want global warming to stop. And what does earth day mean to me? It means to celebrate the earth’s birthday. Also what I want people to do is to recycle so we can help the earth. And also we should turn off the lights every day. And what I’m going to do is to do everything I could do to help the earth. My mind is on tomorrow because tomorrow is the last day of April and then the day after that day it will be the first day of May. I’m nervous about it. My favorite number is 13 because when ever I play a guessing game it’s 13. And also I like the number 13. I love you so much. Because sometimes you clean my room, and you gave me birth. Without you here I would never be alive. And I want to thank you for that. I want to take you to the home free spa. It will be so fun I can’t wait because Marshall has to help me. It will be so funny. I bet he’ll say yuck. I would too but I’m a big girl and I will always be your firecracker. I hope that you will like it. And I will clean the house with you. P.S. I hope you have a good Mother's day. Book is done. It took a week to make it into a book. To make it I put stuff from my blog and put it on my book. That was when I was still working on it. And to make this book I typed it and I had to add stuff from my blog to my book that I was still working on. And at the end I liked my book because it was all my favorite articles from my blog. 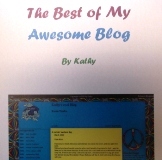 I think the hardest part was because you have to put a picture of my blog. My mind is on the man in chicken suit. He looked so funny, and my bother, and a box of cheese. I’m also wondering what we are going to have for lunch. I hope that it will be a box of cheese. Next year I don’t think that I’m going to write on my blog next year because I don’t have a computer. Also I think that I have 26 articles on my blog. That’s how many there were last time I looked at my blog. My best articles are all 26 of them because they are all awesome. I hope that other people like all of my blog articles. I hope they do. Also it very good to have a blog because you can improve on your spelling skills and also it is fun to go on the computer.